2. Use Celery for asynchronous tasks AND cron jobs (no need to use unix crontab): The first two weeks of development you might not need to shove something into an asynchronous process, but when your non-technical co-founder starts asking why the site is hanging, it’s time to bust out celery (there are other options if you need something more lightweight). Any call that doesn’t need to be synchronous can be queued up and eventually consumed by a celery worker. I recommend using redis as a celery backend (see below) - do not waste your time with RabbitMQ unless you have a good reason to. I use celery for all sorts of tasks from sending out emails to pulling data from the Facebook API. Another intersting use of celery is you can setup periodic tasks to act as a cronjob. When I first started developing Math and Pencil, I was using UNIX crontab but have since moved everything into celery. Update: This assumes NGINX is managing all incoming requests and serving static content. 5. Use named URLs, reverse, and the url template tag: This one seems dumb, I know, but man - I wish I knew about reverse when I started. Do yourself a favor and name all of your urls, and only refer to them by name in both templates using the url template tag and using reverse in the backend. It will potentially save you a lot of time in the future because nothing will be hard-coded and one url change will not break the site and unit tests. 6. Get your settings.py file right: There has been a lot of discussion about what is the right approach to Django settings. You can read about these discussions here and here. Personally, I like adding local_settings.py to my top-level directory and then importing it at the bottom of my settings file, overriding any variables declared above it in settings.py. My method works well for me, but you should definitely figure out how do separate development, staging, and production level settings. 7. Use supervisor for process monitoring: If you havnt heard of supervisor yet, and you are deploying to a unix-based machine, go here and start reading. Supervisor will control all of your processes for you. You just need to add a separate configuration file for each process. If the process goes down, supervisor will bring it back up. Examples of supervisor processes: Celery-beat, celery, gunicorn, statds, mongodb etc. 9. Use Redis - because it will eventually be your best friend: As I suggested above, at the beginning, Redis can just be used to queue your celery jobs. Later on, when the time comes you can store your sessions to redis. Then, you can use redis as a cache. Then you can use redis for auto-completion. Then …. I rest my case - just use Redis! 10.Use munin and statds for process monitoring. Munin lets you make nice graphs of almost anything, statds lets you time or count (increment) anything. Add these to your project as soon as possible and monitor everything. 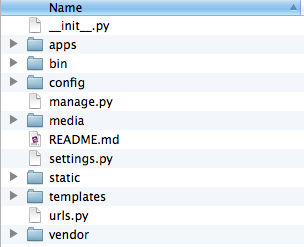 You can easily write your own munin plugins in Python to monitor just about everything. Two years later, two years wiser, and many customers and mess-ups later, that is what I wish I would have done differently. If you are interested in content like this, please follow me at @josephmisiti.